New aftermarket combine concaves bring never seen before performance with an unbeatable return-on-investment. You're welcome farmers. BALTIC, SD, USA, July 31, 2018 /EINPresswire.com/ — The most advanced combine concave technology from threshing to separating is featured in the new XPR Concave System just in time for harvest. This includes three new threshing concaves and new separation grate from Estes Performance Concaves that offer producers never before seen performance in all crops, from one set of concaves. The XPR concaves might look like any other concaves but not all concaves are the same, the old saying the devil is in the details has never been more true. All you need is a sharp eye and you will quickly see the performance is actually in the details, every minute detail of this concave system has been engineered for superior threshing and separation in all crops. Unbeatable performance that threshes better, captures grain better and only leaves the competition in the dust. There is no other concave system that compares, it is 100% millimeter-by-millimeter different than any other combine concave on the market. Better bar, better spacing, better cover plates, better separation, all for superior performance. Many have tried to accomplish what the XPR Concave System can do, but none come close in performance. Harvest and planting is precious to our customers and they can’t afford to waste their time struggling with other aftermarket concaves. XPR concaves work in all crops. Time equals money. Not having to change out concaves when going from one crop to the next or corn to hard threshing wheat has been impossible, until now. The XPR perforated cover plates are the key to making this “unbelievable advantage” achievable. In comparison to other cover plates or bands the perforations allow grain to be threshed and captured sooner. Solid covers can cause one of three problems: less area for the smaller grains to escape onto the augers when threshed, over threshing resulting in grain damage or worse, forcing the crop to be thrown over the rotor further resulting in “rotor loss.” The XPR covers distribute grain evenly onto the augers and capture grain when it’s threshed so no more over-threshing or overloading augers. Threshing is the cornerstone of harvesting, which is why we have “maximized” threshing with the new XPR System. Our notched bar has 137% more effective threshing surface area than round bar concaves. Maximized threshing means threshing grain sooner and completely without tailings, whitecaps and unthreshed heads. Once grain has been threshed it can be captured, this means less grain damage as grain exits the concave sooner. Superior threshing is great but you must get the grain out. That is why the XPR Concave System is significantly more open than OEM concaves. This all amounts to eliminating rotor loss, minimizing damage to crop and increased capacity. You are finally able to thresh hard red winter wheat one day and then cut into that high moisture, high yielding corn with ease the next. Let’s talk rotor loss. Rotor loss is caused by an overloaded separation section. So how do you stop throwing all that grain over the rotor or spitting it out the back? Well, you simply STOP the overloaded separator. The XPR’s Xtreme Separation Grate is exactly what you need (in addition to unloading more grain in the concave section). The separation grate is comprised of 143 disrupter fingers that fluff and toss your crop as it should be, forcing the release of grain onto the sieve, preventing it from being thrown out the back of your combine. If you're a farmer frustrated with your combine’s performance whether it’s rotor loss, damaged and cracked grain, slow ground speed, lack of capacity, dirty sample or changing concaves then Estes new XPR Concave System is the answer. Take back your bushels and save time this harvest, visit https://www.estesperformanceconcaves.com/xpr-concaves or call 1-765-650-4131. Estes Performance Concaves is a world leader in providing the most advanced and cutting edge combine concaves and is committed to the success of farmers across the world. Good is the enemy of great and we refuse to be second and will not stop innovating, testing and building up success after success until every kernel harvested ends up in the farmers tank. There is no compromise and we accept only the best and to God be all the glory. VANCOUVER, BC, CANADA, July 31, 2018 /EINPresswire.com/ — Bard on the Beach announced today that as a result of record-breaking demand for its ‘60s-inspired romantic comedy As You Like It, the Festival’s 29th season will be extended by a week to allow for added performances. The closing night for the Beatles-song-filled musical will now be on Friday, September 28, with four added performances in the extension week. Additional performances of As You Like It are scheduled for Tuesday, Wednesday, Thursday and Friday evenings, Sept 25-28, at 7:30pm. The Festival’s productions of Macbeth, also on the BMO Mainstage, and Lysistrata, on the Howard Family Stage, will both close on Thursday, September 13. Closing night for Timon of Athens, on the Howard Family Stage, will be Sunday, September 9. Availability for some performances is very limited – check online or call the Bard Box office. Visit bardonthebeach.org for full details on all the productions and upcoming special events (Bard-B-Q & Fireworks and Opera & Arias: Bold and Beautiful), the revised schedule and to buy tickets, or call the Bard Box Office at (604) 739-0559. Bard on the Beach is one of Canada's largest not-for-profit, professional Shakespeare festivals. Established in 1990, the annual summer festival’s mission is to perform, explore and celebrate the genius of William Shakespeare, surrounded by the natural beauty of Vancouver, British Columbia. The 2018 Festival will run in Vanier Park from June 6 to (extended date) September 28. Bard also offers year-round education and training programs for youth, adults and theatre professionals in its administrative home at the BMO Theatre Centre in Vancouver’s Olympic Village as well as in schools and community facilities throughout BC’s Lower Mainland. For more information and for interviews, contact Cynnamon Schreinert. 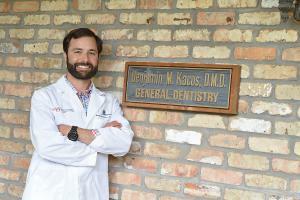 SHREVEPORT, LA, UNITED STATES, July 31, 2018 /EINPresswire.com/ — Shreveport's Dentist, Dr. Ben Kacos and team are asking for support form our patients and community to donate to our local elementary students. It's back to school and we couldn't be more excited to bring smiles to the faces of the kids and parents in Shreveport, LA. It's a small gesture that goes a long way for families who need support with the expense of back to school shopping. We hope you will join us in investing in the future leaders of our community by donating a backpack and or school supplies to our office. All donations will be delivered directly to local schools. Visit us on Facebook for backpack drive updates, photos and more! A recent study was conducted by the Auto Insurance Center from data that was compiled by the National Highway Traffic Safety Administration (NHTSA). SALT LAKE CITY, UTAH, UNITED STATES, July 31, 2018 /EINPresswire.com/ — A recent study was conducted by the Auto Insurance Center from data that was compiled by the National Highway Traffic Safety Administration (NHTSA). It listed the causes behind fatal car accidents throughout the United States from 2009 to 2013. 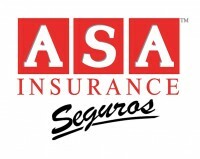 ASA insurance, provider of vehicle insurance in Salt Lake City, UT, says this report contains valuable information for drivers in Utah because it alerts them to potential issues before they occur. According to the report, the top reason for fatal car accidents in Utah was failure to keep in the proper lane. This reason was the main issue for a majority of states throughout the country. However, Utah was not listed among the top five states most affected by this issue. Wyoming was number one with Mississippi, Tennessee, Vermont and Idaho rounding out the list. The information was gathered from NHTSA data and the number of crashes in each state for each type of issue was divided by the population of the state to create an accurate comparison. Utah fared well when compared to other states for drunk driving accidents. It is listed as the fourth state with the least number of drunk driving crashes. Utah comes in right behind Washington DC, New York and Massachusetts. The differences between the other states and Utah is they have more urban areas with public transportation. Generally, issues with drunk driving are more prevalent in rural areas where a lack of public transportation increases the risk of people driving drunk. However, Utah is the exception to this rule due to its strict drunk driving laws and the high Mormon population. The report also noted that for Utah snow causes more accidents than rain. It also results in more accidents than fog. Crosswinds also account for car accidents in Utah, which is among a handful of states to have this issue, most of which are in the southwest. Speeding is another factor in fatal car crashes, and Utah ranked neither highest nor lowest in this category. It did rank well below its bordering state of Wyoming which was listed for second highest. The study accounts for driver and passenger fatalities as well as pedestrian deaths. The data is important because it lets insurance carriers know what actions and situations cause the highest-risk for drivers. It is also important for drivers to help them become more aware of potential accident situations. As drivers become more aware of risks for car accidents, they can alter their behaviors to help prevent these issues which could result in death and injury as well as an increase in insurance rates for multiple claims filed. John Smith works for John Smith Insurance Agency which provides car insurance in Colorado Springs. Affordable rates and superior service for all home, auto and business/commercial insurance needs. Dog owners are a higher risk for agencies that provide home insurance in Colorado Springs. COLORADO SPRINGS, CO, UNITED STATES, July 31, 2018 /EINPresswire.com/ — Dog owners are a higher risk for agencies that provide house insurance in Colorado Springs. They may bite a person even if they are not known to be dangerous or a guard dog. You need to understand these risks and be prepared if you plan to get a four-legged friend to add to your family. John Smith Insurance discusses those risks to help homeowners understand what they need to do. John Smith Insurance recommends doing plenty of research before getting a dog. Compare breeds and know what kind of behavior to expect. If the person chooses to get a dog from the pound or a rescue, they need to ask a veterinarian or another expert about breeding to ensure the animal fits their needs. They should also pay attention to behavior signals for signs of aggression. It is also a good idea to visit the dog a few times and see how it reacts to children and other animals. For those who prefer to get a pup, they can attend obedience classes to teach the dog how to listen to commands. If they get an older dog, they will need to give it time to adjust to a new home and routine. It may be best to limit contact with visitors until the dog feels safe. The dog owner will need to carry enough home insurance to protect them from a claim if the dog should bite someone. Even the best behaved dogs can cause an accident if they are afraid or feel challenged. The owner should always have them on a leash when they go for a walk. They should shorten the leash when they meet or pass someone, especially if the other person has a dog as well. The property should have a fence or a kennel to keep the dog away from visitors, including mail carriers, utility workers and delivery drivers. When considering the amount of liability insurance a homeowner should carry, it is important to understand the costs involved with this type of incident. A minor dog bite might only require some antibiotics for infection and possibly stitches. A major attack can include emergency treatment, multiple surgeries, therapy and reconstruction. This can run into thousands of dollars. Once the home insurance limits have been reached, the other expenses are the responsibility of the homeowner. “We always advise people to think about worst case scenario in a claim,” says John Smith. “When buying home insurance in Colorado Springs, think about how much one incident can cost. You don’t want to end up selling your home or liquidating your retirement fund to pay for the medical bills.” Smith recommends purchasing a policy with enough coverage to pay for a major incident. If a person has quite a few assets, they may even need an umbrella policy to cover extra expenses or a lawsuit. Owning a dog can be fun and rewarding, but a person must be prepared for injuries that can result. Jenkintown's Marc Weinberg of Saffren & Weinberg has been handling workers' compensation cases for decades. JENKINTOWN, PENNSYLVANIA, UNITED STATES, July 31, 2018 /EINPresswire.com/ — Workers’ compensation provides important benefits, like medical care and compensation for missed work and lost wages, for people who suffer from work-related injuries or illnesses. Workers are not always aware that this coverage expands beyond simple physical injury like a fall at work. Workers’ compensation claims can be for a wide variety of traumatic events, injuries, and illnesses, like chemical exposure and work stress-related medical problems. One commonly overlooked illness that workers may be entitled to file a workers’ compensation claim for is Post-Traumatic Stress Disorder, more commonly referred to by the acronym PTSD. Workers often think that PTSD is not something they can have or that it is not covered because it is not a discrete, single accident or illness. The National Institution of Health (“NIH”) describes PTSD as a mental health condition or disorder, comprised of a number of different types of symptoms, that some people develop after experiencing a “shocking, scary, or dangerous event.” The duration and severity of PTSD vary from person to person as does the triggering event. The triggering event leading to PTSD does not have to have an immediate negative physical impact on the person. For example, someone might suffer from PTSD after the sudden death of a close family member or after a home invasion even though they were not physically harmed. There is no single list of symptoms for PTSD and there are many different physical and psychological symptoms that PTSD can cause, ranging from vivid flashbacks to being easily scared to uncharacteristic bursts of anger to vomiting. The many PTSD symptoms are divided into four different categories: re-experiencing symptoms, avoidance symptoms, arousal and reactivity symptoms, and cognitive mood symptoms. A PTSD diagnosis usually requires at least one symptom in each category and continuation of symptoms for at least one month. One common misconception about PTSD is that it only impacts war veterans. The most publically known and severe cases of PTSD have been in relation to war veterans, police officers, first responders and others who engage in daily activities that routinely put them into traumatic events. There is an epidemic of PTSD in this country among veterans, but everyday individuals from construction workers to customer service reps at an insurance company may also suffer from PTSD. It is a mental illness that can be exacerbated by a workplace incident and turn into a long term workplace injury. It is not uncommon for PTSD symptoms to be overlooked or downplayed because the individual does not think they could suffer from it or that their trauma or psychological injury was bad enough. This is not the case. PTSD is a very serious medical condition that can continue to worsen and negatively impact an individual’s health and well-being if untreated. If you think there is a possibility that you are suffering, you should take steps to obtain medical treatment immediately. Once PTSD is understood, it is easy to see how workplace events and environments can cause PTSD. There are two different ways that PTSD can arise from work: (1) Something scary, traumatic, or dangerous happens at work leading to PTSD from the event; or (2) Something scary, traumatic, or dangerous occurs outside of work but was triggered by something at work. No matter the exact cause of the PTSD, it must be “work-related” to be covered by workers’ compensation and qualify someone for disability benefits. A company's insurance carrier will need medical evidence to verify you are an injured worker entitled to workers' comp benefits. PTSD arises from a person’s natural, but harmful, reaction to an event, not from the harm the event itself causes. Accordingly, both persons harmed in traumatic workplace events and those who are not harmed by the event itself but by their reaction to it may be entitled to workers’ compensation benefits from PTSD. Witnessing a Violent Death at Work – PTSD often arises after a person has witnessed a violent death in the workplace. It is common in law enforcement officers who are exposed to violence as a part of their job. Unfortunately, other professions like teachers and administrators sometimes experience violence, in the form of shootings, at work as well and may suffer from PTSD as a result. Injury in a Traumatic Work Accident – Actual injury resulting from a workplace accident can lead to PTSD in addition to the other physical harm caused by the accident. For example, a worker that suffers from a severed thumb when a piece of machinery malfunctions may continue to suffer from PTSD from the trauma of the event long after they have obtained the maximum medical recovery of their thumb and hand. Witnessing a Traumatic Work Accident – As noted above, it is not just being injured at work that can lead to PTSD. Persons who observe a serious traumatic accident at work, like a co-worker suffering from a limb dismemberment, may also suffer from PTSD as a result and, if they do, they are entitled to pursue workers’ compensation as well. A Near-Miss that Could Have Resulted in Death or Serious Harm – Even if no one is harmed, a situation that almost results in serious bodily harm or death is a common cause of PTSD symptoms in those present at the event. For example, a shooting that occurs at work where the assailant misses all shots could cause those present to experience PTSD symptoms after the event. Or another example, a portion of a building collapses on a construction site and narrowly misses falling on workers could lead to PTSD in the nearby workers. Being Trapped – Mine workers, or any other worker that is trapped in a confined space at work, may suffer from PTSD as a result even if no physical harm occurred. This type of confinement is a very traumatizing event for many people. Unfortunately, merely suffering from work-related PTSD is not enough to obtain workers’ compensation. The PTSD must be severe enough to impair your ability to fulfill your job duties. If you are suffering from work-related PTSD but still able to function at 100% of your former level at work, you probably will not be able to obtain workers’ compensation for your PTSD. However, for your future health and well-being, you should still make sure to be seen by a medical provider to obtain treatment for your PTSD. As with all workers’ compensation claims, when pursuing your PTSD claim, it is important to obtain medical evaluation and diagnosis regarding your PTSD claims, provide your employer with notice of your claims (which can be trickier since PTSD cannot always be tracked to an exact start date), and to complete all required employer and government paperwork. PTSD workers’ compensation claims are some of the more difficult claims to pursue because of the nature of the disorder and the fact that the law on the issue is still evolving and not always clear. For this reason, it is usually prudent to find a work injury lawyer to help ensure you don’t lose the opportunity to obtain the benefits you are entitled to. Marc Weinberg, Lawyer, of Jenkintown and Ken Saffren, Attorney are named partners at Saffren & Weinberg which is located in Jenkintown, PA. The team works tirelessly to help improve the situations and lives of victims that have been involved in auto accidents and suffered personal injuries. The firm is known as "The People's Voice In Court" and they make themselves available via email on the website or by phone 215-576-0100. They provide a no-charge, complimentary case review and are more than happy to answer any questions that you may have. How Long Does a Patent Last and What Do Different Types Entail? An IP Lawyer Explains. Your intellectual property rights are protected when you obtain a patent. But for how long? PHILADELPHIA, PENNSYLVANIA, UNITED STATES, July 31, 2018 /EINPresswire.com/ — There are two primary types of patent: U.S. utility patent and a design patent. According to the United States Patent and Trademark Office (USPTO) a utility patent is typically granted for 20 years from when the utility patent application is filed. The patent holder will have to pay periodic maintenance fees to sustain the enforceability of the patent. A design patent is generally granted protection for 14 years measured from the date the design patent is granted. A patent is a term a new variety of people have questions about almost every day. While most people are aware that patents are an integral part of intellectual property rights, not everybody is aware of the facts or can even claim to know in depth what one is. According to Wikipedia, "A patent is a set of exclusive legal rights granted by a sovereign state or intergovernmental organization to an inventor or assignee for a limited period of time in exchange for detailed public disclosure of an invention. " The exclusivity for the producing or using the concerned product that is patented, its process, or design is limited for a period of time. The details of patent protection are conveyed via a legal patent letter. ‘How long does a patent last’ is a fairly common question and is difficult to get a straight answer for without seeking legal advice from a law firm or the U.S. patent office itself. It is important to know about various kinds of intellectual property protection before you can find the correct reply to this subject matter. Remember that the law of the United States of America recognizes a number of different patents at present. Each of them remains valid for a stipulated period of time. Before you are granted patent rights and become a patent owner, there are quite a few things to consider as you begin to understand how long are patents good for, including earliest filing date, non-provisional application versus provisional patent application, provisional filing date, patent extensions, public domain and any third parties IP rights. Knowing about the US Patent law happens to be the very first step to learn how long is a US patent good for. Each kind varies sharply depending on the nature of the patent. A design patent remains in force for as long as 14 to 15 years from the date that it had been granted the right. It depends on the date of filing as well. However, most individuals are interested in the utility kind when they expect an answer to the query of how long do patents last. In the United States, a utility patent is granted for processes, compositions, and machines. This is also the most common type of patent filed and is valid for 20 years, which answers the most often asked question about the validity of a patent. However, the period is assessed from its first filing date. The matter gets intensely complicated if you have chosen to file for the patent multiple times. The date of filing is all important here. Remember that each filing date is included in the records made available publicly. Going through the databases that are available to the public would give you access to the date that had been recorded by the patent office at the time of filing. It is easy to calculate the validity of the patent therefore once you are apprised of the filing date of a specific patent. Unfortunately, there is no restriction on filing and, a single patent can be filed on several occasions making the calculation slightly complicated. Applying for a provisional patent is a common way of securing the filing for a utility patent. Think of it as the first step of the patent protection process. In fact, many companies, as well as individuals, opt for a provisional patent so as to include an informal provisional patent application on file. This will allow you a breather of up to a year. You can use the time effectively to fine tune your products and machines. You are also welcome to find investors and create prototypes for your creations meanwhile. The process may be advantageous to a certain extent but comes with certain drawbacks as well. The validity of your patent will be counted from the earliest date, i.e., the date of provisional application. The patent will be due to expire a year in advance, therefore. You must thus be sure of taking the right date into consideration while calculating the validity of the patent. Many people are familiar with the phrase "patent pending," but what does that actually mean? The life of your patent is limited of course but the period of 20 years may be further reduced due to its pending status. The first filing date happens to be pivotal as the entire process will be hinged on it. Although your patent remains valid from the date mentioned yet, you will not be able to enforce it until and unless the patent office issues it for you. Fortunately, you will be awarded a ‘patent term extension’ should an unnatural delay in claims occur due to a fault of the patent office. If you've been searching for "patent lawyers near me" then look no further. Paul and Paul is the premier patent attorney you are looking for. We can help you with your patent questions and issues! Contact us today at (866) 975-7231 for a free case consultation. 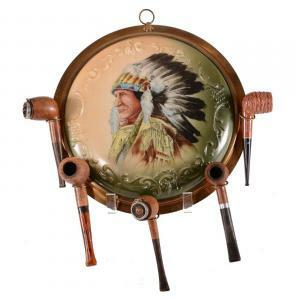 Unmarked Wave Crest pipe holder plaque with a portrait of an Indian in full headdress. Unmarked, 17.5-inch-tall Wave Crest vase, 10 inches across handles, with handpainted scenic decor. 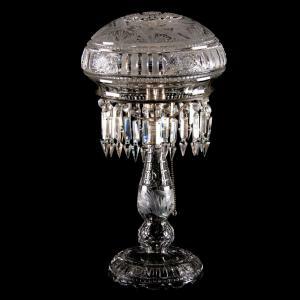 American Brilliant Cut Glass table lamp, signed Gundy and Clapperton, with engraved scene of flying geese. American Brilliant Cut Glass punch bowl in the Sunburst pattern by C.F. Monroe, with nine pattern-matched punch cups. Marked 17.5-inch Nakara vase showing a night scene of sailboats in a harbor, with Vermillion blue highlights. It's the lifetime collection of Don and the late Carrol Lyle, whose many outstanding pieces have been featured in books, trade publications and museum exhibits. DOUGLASS, KS, UNITED STATES, July 31, 2018 /EINPresswire.com/ — The lifetime collection of Don and the late Carrol Lyle – dedicated collectors of Wave Crest, Nakara, Kelva and American Brilliant Cut Glass whose items have been featured in books, trade publications and museum exhibits – will be sold without reserve in a two-day auction slated for Sept. 7th-8th by Woody Auction, in the firm’s auction hall at 130 East Third Street in Douglass, Kansas. The Lyles, who hail from Washington state, began collecting glassware pieces decades ago, with their main focus being on items produced by the C.F. Monroe Company (Meriden Conn., 1882-1916). 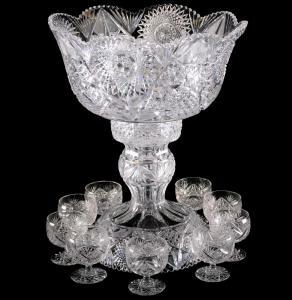 The Lyles loved the quality of the Wave Crest, cut glass and other items created by C.F. Monroe, and managed to assemble one of the foremost collections in the country that featured these lovely pieces. Highlighting the two-day sale will be 350 lots of Wave Crest, Nakara and Kelva, plus over 300 lots of American Brilliant Cut Glass, which will play an equally significant role in the event. The Friday, September 7th session, starting at 5 pm Central time, will contain lots 1-250. The balance of the catalog (lots 251-670) will come up for bid in the Saturday, September 8th session, starting at 9:30 am. Stars of the Wave Crest category include an elaborate handpainted panel featuring an early Venice, Italy scenic décor, signed “C.V.H.” (for Carl V. Helmschmied), mounted in a 29 ¾ inch by 23 ½ inch oak frame; and an unmarked pipe holder plaque in green and cream tones with a portrait of an Indian in full headdress, plus an embossed scroll design and set in a brass frame holding five Wooden English pipes. 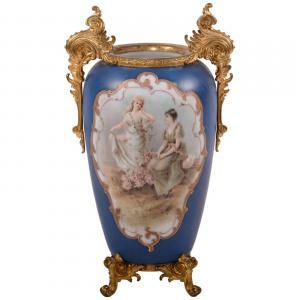 The unmarked, 17 ½ inch tall Wave Crest vase (10 inches across handles), has a handpainted scenic décor showing two women near a bench and a reverse showing a chrysanthemum décor, with gilt metal feet and handles and a cobalt blue border, is outstanding; as is the unmarked Wave Crest dresser box in cream and blue tones with an underwater fish scenic décor, gold stencil highlights and gilt metal feet. A Wave Crest banner mark vase, 17 inches tall, deep emerald green, showing a classic courting scene, with Vermillion trim highlights, gilt metal feet and handles, is nearly identical to the vase shown on page 47 of Cohen’s Wave Crest book. Also offered will be an unmarked Wave Crest wall plaque, 12 inches by 8 ½ inches, depicting a woman in a sheer pink dress, housed in an ornate gilt metal frame. Additional Wave Crest lots of note include an unmarked wall plaque with cobalt blue border and scroll mold, depicting a woman in a sheer dress holding a wreath, in an ornate gilded frame measuring 16 inches by 12 inches; and a rare wall plaque marked C.F. Monroe, with a colorful floral branch décor, artist signed “S” (attributed to Gussie Stremlan) and mounted in a 27 ½ inch by 21 inch wooden frame. American Brilliant Cut Glass (ABCG) is enormously popular with collectors and the Lyles were no exception. Pieces in the auction will feature a high-quality punch bowl in the Sunburst pattern by C.F. Monroe with an exact pattern matched base and nine pattern-matched pedestal punch cups; and a decanter in the Croesus pattern by J. Hoare, 12 ½ inches tall, with a ray cut base and quality blank. Also sold will be an ABCG table lamp, 19 ½ inches tall, signed Gundy and Clapperton, boasting a fabulous cutting of hobstar cluster and Millicent stripes, with a finely engraved scene of geese flying over cattails; and an ABCG vase, 14 inches tall, in the Odolet pattern by C.F. Monroe, with a hobstar base and heavy blank, exactly as featured in the Monroe catalog #11, page 42 (only this one is larger). ABCG top lots continue with a three-part epergne in the Starlight pattern by C.F. Monroe, having a trumpet vase center section with a sterling fitting atop the center bowl, and a sterling silver rest engraved with “Connor New Year’s Day 1907”; and a humidor in the Marlboro pattern by Dorflinger with an embossed floral wreath marked Dorflinger and a ray cut base, 8 inches tall and 6 inches wide. 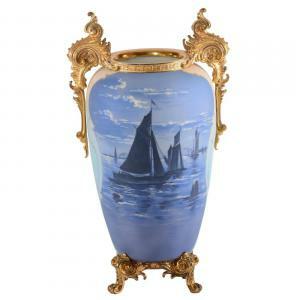 •	A marked, 17 ½ inch tall vase showing a night scene of sailboats in a harbor, done in cobalt blue with pale blue and cream side panels, Vermillion blue highlights and gilt metal feet and handles. •	A humidor marked Nakara, measuring 5 ¾ inches by 4 inches, done in brown and rust tones, with a portrait of an Indian in full headdress and the word “Cigars” showing on the humidor lid. A preview will be held on Friday, the first day of auction, from 12 o’clock noon until the first gavel falls at 5 pm. For those unable to attend the event in person, Internet bidding will be facilitated by www.liveauctioneers.com/woody-auction-llc. Online bidders are encouraged to register at least 48 hours in advance. For info, terms and conditions, visit the Woody Auction website: www.WoodyAuction.com. Absentee bids will be accepted, with a written statement indicating the amount of the bid. 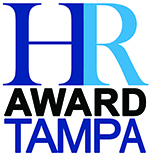 The deadline to submit an absentee bid is noon Wednesday, September 6th. For convenience, absentee bids may be submitted by fax, at 316-746-2145, or e-mail, at info@woodyauction.com. There is no phone bidding. For lodging, there are three hotels in the area. The Comfort Inn, in Augusta, KS (316-260-3006); the Holiday Inn Express, in Andover, KS (316-733-8833); and the Hampton Inn, in Derby, KS (316-425-7900) are all within a 15-20 minute drive from the Woody Auction facility. Woody Auction will conduct regular auction events in the Douglass location and occasionally at other venues in the area. •	August 18, 2018 – The Margaret Ireland collection of Carnival glass. •	September 7-8, 2018 – The Lyle collection of Wave Crest, Nakara, Kelva, ABCG. •	September 29, 2018 – Part 2 of the Headlee collection of RS Prussia. •	October 20, 2018 – The Rex collection of Brilliant Period Cut Glass. •	November 9-10 – Antique auction, to include sterling silver, furniture, art glass, dolls, music boxes, clocks and more. •	December 15, 2018 – Antique auction (details to follow). Woody Auction is always accepting quality consignments for future sales. To consign an item, an estate or collection, you may call them at (316) 747-2694; or, you can e-mail them, at info@woodyauction.com. To learn more about Woody Auction and the auction on September 7th-8th, visit www.woodyauction.com.